ISLAMABAD, April 8: The Patron in-Chief of Supreme Shia Ulama Board and Head of Tehreek e Nifaz e Fiqah Jafariya Agha Syed Hamid Ali Shah Moosavi has said that honoring Modi with the highest level of civil award by the UAE is equivalent to rubbing salt on the wounds of Indian Muslims and Kashmiris while also an expression of enmity against Pakistan. If this continues, Muslim states will also be honoring Netanyahu for strengthening Israeli occupation on the Qibla e Awal. Pakistani Prime Minister is given the reward for his driving. When exactly those who used to tell stories of Iqbal’s falcon will abandon begging? Rulers must not forget the saying of Ameerul Momineen Ali Ibn e Abi Talib (A.S) which tells that a friend of the enemy is also enemy. Foreign policy must be reviewed, and national dignity and honor must not be compromised. Muslims of Gaza and Kashmir are under continued siege and aggression. The secret behind creation of 39-States Islamic Military Alliance could not be revealed till date. The courage and bravery of the protector of the mission of Tauheed o Risalah Syeda Zainab bint-e-Ali (A.S) shattered the pride of Malookiyat, protected the righteousness of the deen e Mustafawi, Islam will always be obliged to Imam Hussain (A.S) and Syeda Zainab (S.A). He said this while addressing to a program held to celebrate the birth anniversary of the granddaughter of the holy Prophet (PBUH&HP) Syeda Zainab bint-e-Ali (A.S) on the start of Hafta e Wila e Muhammad o Aal e Muhammad (PBUT). 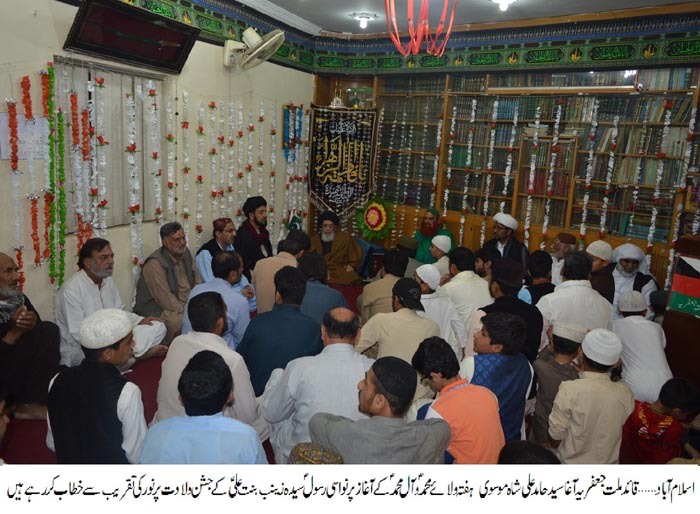 Agha Syed Hamid Ali Sha Moosavi noted that the unity of the Islamic world has shattered after falling prey to the greed of materialistic and worldly interests. Contrary to the teachings of Islam, if sanctions are imposed against one Muslim country, the other Muslim state celebrates it, if one progresses the other envy it. Almighty Allah blessed 5 dozen Muslim states and 2 dozen Arab countries with all kinds of resources and they are filled with the treasures however, it is very unfortunate that Muslim rulers are playing in the hands of evil forces as they are completely unconcerned about the issues of Palestine, Kashmir, Yemen, Libya, and Afghanistan while their sole objective is to protect their own rule. He said that one after the other, Muslim countries were imposed with rulers who only strengthened the evil powers and their same weaknesses may encourage Trump to accept occupied Kashmir as a legitimate part of India in future. Saudi Arabia had extended extraordinarily lavished hospitality to Trump and countless precious gifts while Modi was awarded with the highest-level award while now UAE has announced to offer its highest-level award to Modi. Muslim rulers must clarify as which of Modi’s services for Islam are being rewarded with such awards? Even international organizations were crying against the bloodshed of Muslims by Modi, Muslims are being lynched alive on the matter of cow slaughtering, new records of atrocities have been made in the occupied Kashmir. The behavior of Muslim rulers is inviting wrath of God. Agha Syed Hamid Ali Shah Moosavi said that the ruler of country who was given an unforgettable reception by the Prime Minister of Pakistan, reciprocated with hugging and rewarding Pakistan’s enemies while the delegation from China who always helped Pakistan and the CPEC project made by Chinese cooperation is a source of apprehension for the enemies of Pakistan, was received through the clerks. He said that after the fall of Ottoman Caliphate, the geography of Muslims was altered to impose stooges of colonial powers on Muslim countries, their weaknesses were exploited to stab the Islamic world with the dagger of Israel’s creation, then the same rulers founded Arab League to create distance between Arabs and non-Arab nations, acting upon Zionists agendas, they started intervening in each other’s countries while their weaknesses urged Trump to get Jerusalem accepted as the capital of Israel and now he has also announced to accept Golan Heights as her legitimate part. It has been half century since OIC was founded however, its usefulness has never been seen which could stop evil powers. Agha Moosavi regretted on the fact that Muslim rulers have been exerting all their efforts to defame and suppress each other and protect their own rule while the axis of their politics are their personal interests rather than social service which is intensifying the issues faced by the Muslim Ummah. He said that Muslim rulers have failed in creating a system based upon morality and ethics, and its root cause lies in disobedience to Islamic lessons and distancing themselves from the teachings of the holy Prophet (PBUH&HP). Agha Moosavi said that the dismal situation of the Islamic world is caused by the lack of honest national leadership. To save the Islamic world from the catastrophic problems, rulers must come out of their selfish policies and personal gains to prefer resolution of the issues faced by the Islamic Ummah or otherwise, they all must wait for their turn one after the other.